We have all experienced it at one time or another – the surging adrenaline, the building emotional pressure, the rising heat of anger. Sometimes it comes at the most unexpected times. You are driving along the road minding your own business when suddenly, out of the blue, an inconsiderate driver cuts you off. An acquaintance makes a disparaging remark about you or a family member. Or you are blamed for something that isn’t your fault. Whatever the case the feeling that follows is often overwhelming and hard to control. Throughout history there have been many powerful people who have been able to control whole empires but couldn’t control their own reaction to something that made them very angry. 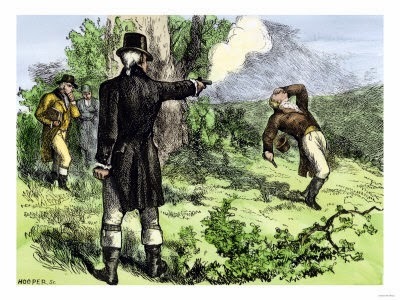 In fact two well-known American political figures, Aaron Burr & Alexander Hamilton, had such bitterness and anger against each other that they ended up in a duel. So what does the Bible say about controlling our tempers? 1) Think before you speak. We should always be quick to listen, slow to speak and slow to become angry (James 1:19). 2) Don’t hold grudges. Do not allow the root of bitterness to grow in your heart. Do not seek revenge but love your neighbor as yourself (Leviticus 19:17-19). 3) Allow humor to temper the situation. Keep a cheerful heart which will be like good medicine, whereas a crushed spirit dries up the bones (Proverbs 17:2). 4) Deal with anger quickly. Don’t let the sun go down on your wrath. As much as is in your power, take care of the situation immediately so that bitterness does not have time to take root (Ephesians 4:26). 5) Don’t associate with those who are easily angered. Don’t make hot-tempered people your best friends or you may develop the same type of mindset (Proverbs 22:24). It’s inevitable that we will experience the emotion of anger in our lives. The important thing is how we handle it. Work to develop the patient and forgiving character qualities that God desires. These are worth more than you will ever know.